Dr. Dubler is a Virtual Facilities Engineer for the Office of Physical Plant as well as an Affiliate Assistant Professor within the Architectural Engineering Department at Penn State. He is responsible for of Building Information Modeling (BIM) operations for University projects and promotes integration into facility operations. Cody is an Integrated Construction Coordinator with Mortenson’s Federal Contracting Group, where he is responsible for supporting field teams through modeling applications. Additionally, Cody is a proponent of BIM’s use to facilitate process integration and deliver key information to Owners to enable efficient operation of facilities throughout their life cycle. About Edward J. Gannon, P.E., Ph.D.
A structural engineer by training, Gannon leads a group of engineers that design and construct new facilities and excel in major maintenance and capital renewal projects. Because of his work in Lean Construction, IPD and BIM, he is sought after for complex projects requiring a collaborative approach. Author(s): Craig R. Dubler, Ph.D., DBIA - The Pennsylvania State University, Cody R. Slack - M.A. Mortenson Company, Edward J. Gannon, P.E., Ph.D. - Urban Engineers, Inc. The Architecture, Engineering, and Construction (AEC) industry is currently going through a vast transformation to improve efficiency. According to a study performed by the National Institute of Standards and Technology (NIST) in 2004, the annual cost of inadequate interoperability is approximately 15.8 billion dollars for the U.S. AEC industry. This study documented the need for increased collaboration throughout the design, construction, and operation of building projects. As a result, Building Information Modeling (BIM) is being widely accepted by the AEC industry because of the potential outcomes. BIM provides a means for owners, designers, contractors, and operators to generate, organize and use detailed information throughout a project life cycle. An important aspect to the success of BIM is the process in which information is exchanged between project team members. In theory, information should be both accessible and usable, when required. BIM has the potential to improve project efficiency; however, it is important that the process is planned as a team in advance and deliverables are discussed at an early stage in the project. The purpose of the implementation of BIM practices should ultimately reflect the purpose of the organization. Many project teams and owners alike strive to utilize BIM without true direction of why they are doing it or what they want to achieve through its implementation. BIM can provide numerous benefits for owners, depending on how it is utilized. Ultimately, BIM increases the level of information sharing, which leads to more informed decision making among stakeholders. In turn, changes downstream can potentially be reduced. Additionally, providing facility managers with the information they need to effectively manage the operational phase of a building’s life cycle can eliminate waste and increase the efficiency of the maintenance workforce. Once the discussion has taken place regarding why BIM should be utilized, the process of its implementation can be difficult within an organization. Numerous silos typically exist within owner organizations, from CAD, to GIS, to Project Management, to Facility Management, and beyond. While BIM provides the potential to integrate team members across a facility’s life cycle, the process of getting each group integrated into a related workflow can be difficult, and requires a detailed planning process. BIM Project Execution Planning is “a process performed by a project team to design the execution strategy for implementing BIM on the project. The final product of the execution planning process is a documented BIM Project Execution Plan (CIC, 2009).” To maximize the effectiveness of BIM, the execution plan should be designed in the early stages of a project and focus on the decisions required to define the scope of BIM implementation on the project, identify process impacts of using BIM, define the team characteristics needed to achieve the modeling, and quantify the value proposition for the appropriate level of modeling at the various stages in the project life cycle. During the development of a BIM Project Execution Plan, four steps should be followed: 1) Identify BIM Goals and Uses; 2) Design the BIM Project Execution Process; 3) Develop Information Exchanges; and 4) Define Supporting Infrastructure for BIM Implementation (CIC, 2009). These steps, depicted in Figure 2, were developed by Penn State’s Computer Integrated Construction (CIC) Research Group through the BIM Execution Planning Research Project. Each step is described in further detail in the following sections. Figure 2. The planning procedure for BIM implementation consists of four main steps. Prior to implementing BIM, the project team should identify the appropriate tasks that the team would like to perform using BIM. This analysis of BIM uses should be focused initially on the outcomes desired by the overall process. Therefore, the team should start with the Operations phase, and identify the priority for each of the BIM uses on the project (High, Medium or Low priority), and then move through the project phases in reverse order (Operations, Construction, Design and Planning). This perspective of 'starting with the end in mind' will identify the downstream desired uses of BIM that should be supported by earlier processes in the life cycle of the project. The first step in developing a BIM Execution Plan is to identify the appropriate BIM goals based on project and team specific characteristics. A current challenge and opportunity faced by the early project planning team is to identify the most appropriate uses for BIM on a project given the project characteristics, participants’ goals and capabilities, and the desired risk allocations (NIBS, 2007). Figure 3 depicts a list of potential BIM uses per phase of a building’s development. As shown in this figure, BIM Uses are developed and utilized in various building phases. The project team should identify the appropriate tasks that the team would like to perform using BIM. 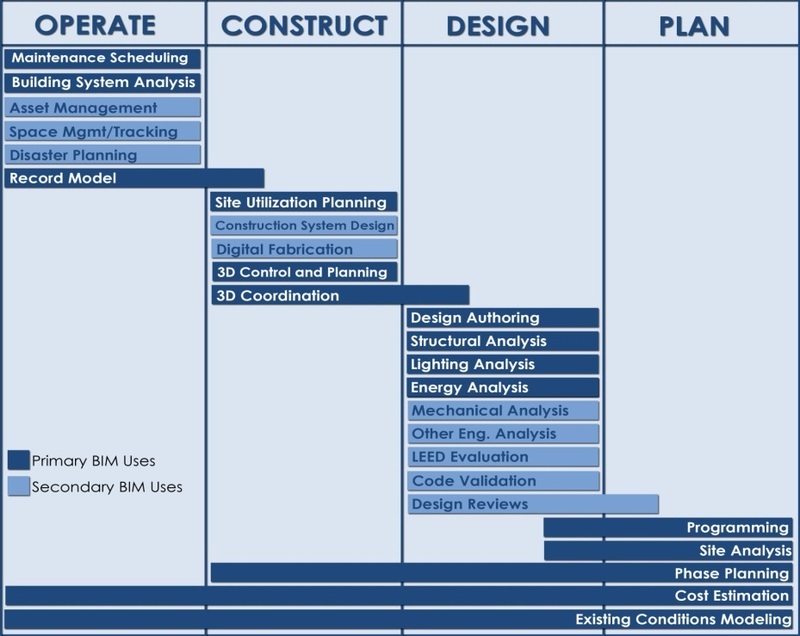 This analysis of BIM uses should focus initially on the outcomes desired by the overall process. Therefore, the team should begin with the Operations phase, and identify the priority for each of the BIM uses on the project (High, Medium or Low priority), and then move through the preceding project phases (Construction, Design and Planning). This perspective of 'begin with the end in mind' will identify the downstream desired uses of BIM. Therefore, it is extremely important that the required decisions that define the scope of BIM implementation on the project be made early on in project life cycle. Figure 3. Numerous opportunities exist to take advantage of BIM. 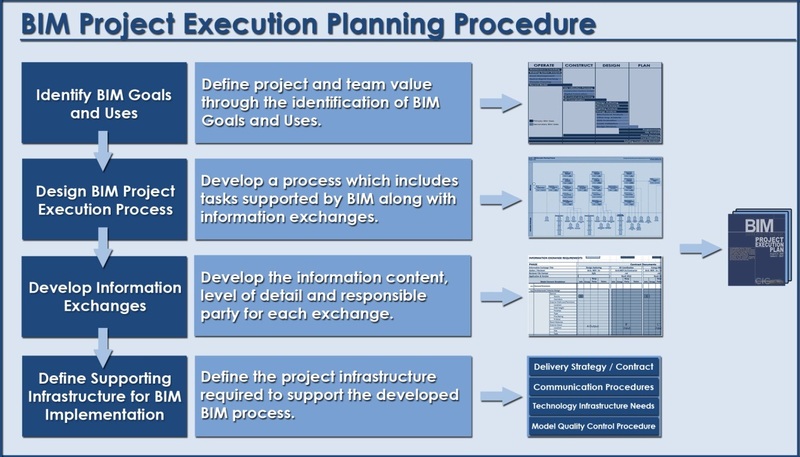 The second step in developing a BIM Execution Plan is to develop a project specific process model. It is critical that the BIM Execution Plan is not developed in isolation. No single party within a building project can adequately outline the execution plan while also obtaining the necessary team member commitments to BIM implementation. Instead, team members need to lay the foundation for a methodology by creating generic process maps for tasks supported by BIM. The team can then develop project specific process maps taking the given maps as templates. These process maps aim to specifically answer what exact information is to be exchanged between team members, and when the exchanges occur. The process planning concept advocates to assist the owners and different project stakeholders in making the implementation decisions early on, and to assist in a smooth transition between various parties involved during various phases. Once the appropriate process maps have been developed, the information exchanges that occur between the project participants should be clearly identified. It is important for the team members, in particular the author and receiver, to clearly understand the information content for each transaction. Every element of a project does not need to be included for a model to be valuable. Therefore, it is important to only define the model components that are necessary to implement each BIM Use. Figure 4 depicts how information flows through a BIM implementation process. This figure was derived from the process map described in step 2 of the BIM planning procedure. Note that downstream BIM uses are directly affected by what is produced by the upstream use. 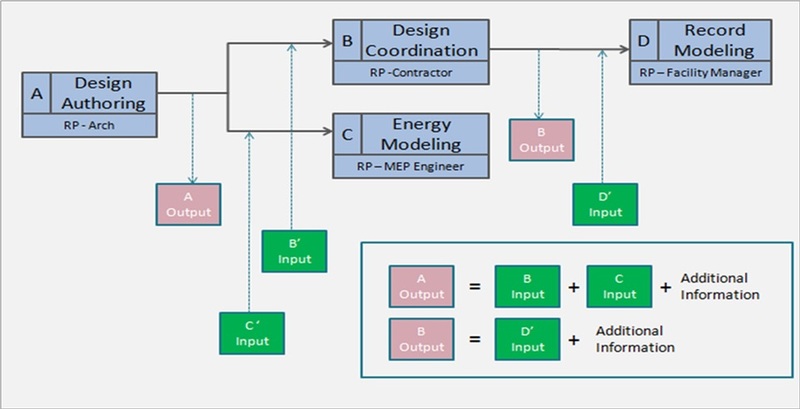 Looking at this example as a pull driven approach; if the model information required for implementing a particular BIM use is not authored by an upstream team member, then the information needed must be created by the responsible party of that use. Therefore, it is up to the project team to decide who should be authoring this information and when this information needs to be placed into the BIM. For simplistic purposes, it is only necessary that the team define one information exchange requirement for each BIM use; although, there may be several exchanges that take place. Figure 4. Process of how information is exchanged between BIM opportunities in difference project phases. Although this is a substantial procedure, it is important that team members work together to further develop requirements that arise after each projects completion. Also, the planning decisions should be made early on in a project life cycle. In the event that the information or resources are not available, effort should be made to revisit the subject matter when the resource can be tapped. Therefore, a BIM Project Execution Plan should be a continuously developing set of rules based on lessons learned from previous successful or unsuccessful attempts of BIM implementation. The philosophy of “begin with the end in mind” means to determine the end user’s needs and work backwards toward the creators of information. Therefore, in order for designers and contractors to understand what is required, owners must first have an idea on how they plan on using BIM in the operation and maintenance phase. This section is dedicated to the opportunities available for BIM implementation post-construction. If planned accordingly, an owner organization has the ability to decrease operating costs through more efficient maintenance (asset management), increase safety of workers through better designed equipment rooms (space management), and decrease the cost of renovations (record modeling). The following section describes a few uses of BIM in facility management (FM), although there are many other opportunities for BIM and FM that are based off of an owners need for models and information during the operation and maintenance of facilities. Asset management is the process of accessing and maintaining something of value in a cost effective manner (Campbell et al, 2010). Value is expressed and measured in the eye of the beholder; therefore, most facility owners classify assets as a building, space or component depending on the mission of the department or end user. 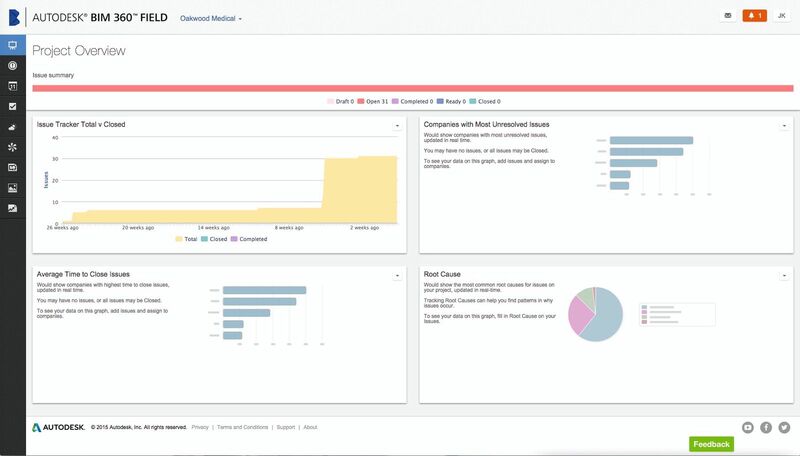 Effective facility operation and maintenance of facilities is a large goal for building owners and many large owners have developed computerized maintenance management systems (CMMS) to assist with the overwhelming task of tracking maintainable facility components. BIM has the ability to provide the facility management team with additional information to hit the ground running at facility project turnover. If planned, the desired data that is used to track maintenance in the CMMS can be configured into the building model from information that is also used for design and construction and ready for input in the asset management system at project close out. 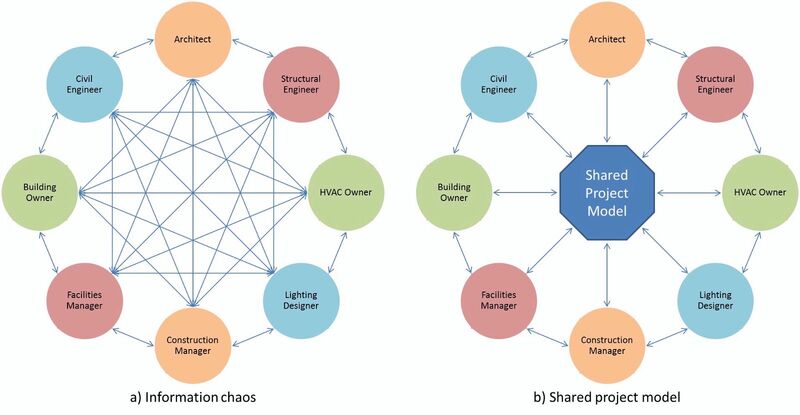 Figure 5 depicts a BIM approach to facility component asset management. By providing the maintenance staff with access to both a CMMS and a model, they are provided with valuable information to make decisions prior to entering the facility. This approach is similar to the push for BIM into the AEC industry – plan the work on the screen prior to stepping onsite. In theory, if a technician has information on the task prior to completing it, there is potential to increase efficiency, in turn increasing the number of work orders performed per person – decreasing the budget for maintenance management. 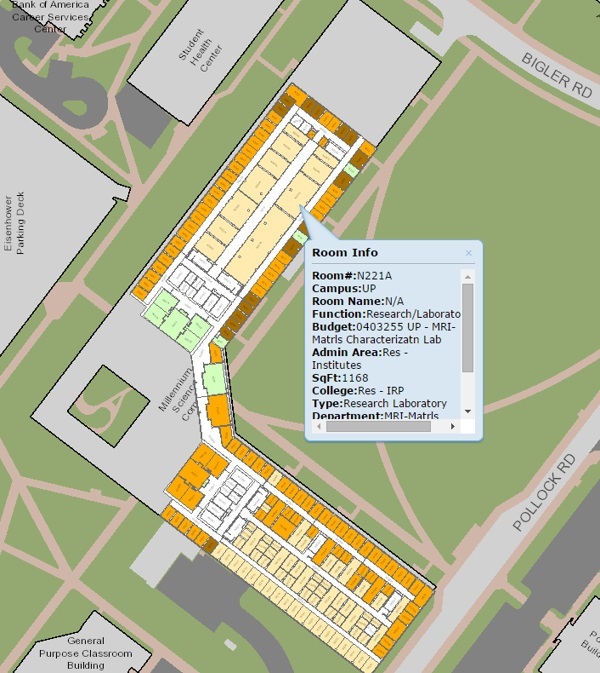 Facility space planning and allocation management is a large part of facility management. Space is a very precious commodity and planning the departmental needs of an organization is essential to maintaining a comfortable and efficient working environment (Gotts et al., 2010). Many large owners have developed detailed standards and systems around space planning and management. BIM has the ability to track space function through design and construction of a facility and produce a representation of each space (2D or 3D), as well as embedded data (e.g. function, capacity, available equipment, etc.). If planned upfront, the turnover of this information has the potential to be very valuable to facility managers and can be integrated into their current system with little effort. Figure 6 is an example of a 2D space management system and is color coded by space function. Beyond overall space management, BIM has the ability to detail the design of a particular space to maximize the benefit to end users. For example, a detailed model can be created for a patient room in a hospital showing the overall layout and detailed equipment location. This model can be very beneficial in facility management to track space use, resources and potentially lower the anxiety of new employees. Additionally, BIM has the ability to increase the safety of future employees by analyzing the space needed to perform daily tasks. Space management using BIM is limitless in the possibilities, but an owner must prioritize what is most important in order to achieve successful information handover and integration into current practices. Figure 6. Space Management system defining the coded function of each space. Upon completion of a building project, it is very important that the facility management team receives an accurate and complete representation of the built environment for multiple uses in operations and maintenance. Traditionally, this process included copies of 2D marked-up record drawings, specifications, submittals and operation and maintenance binders filled with limited information on building components. The digital era has simplified the process for creating documents; however, because it is simplified, owners are often overwhelmed by the number of record documents they receive. 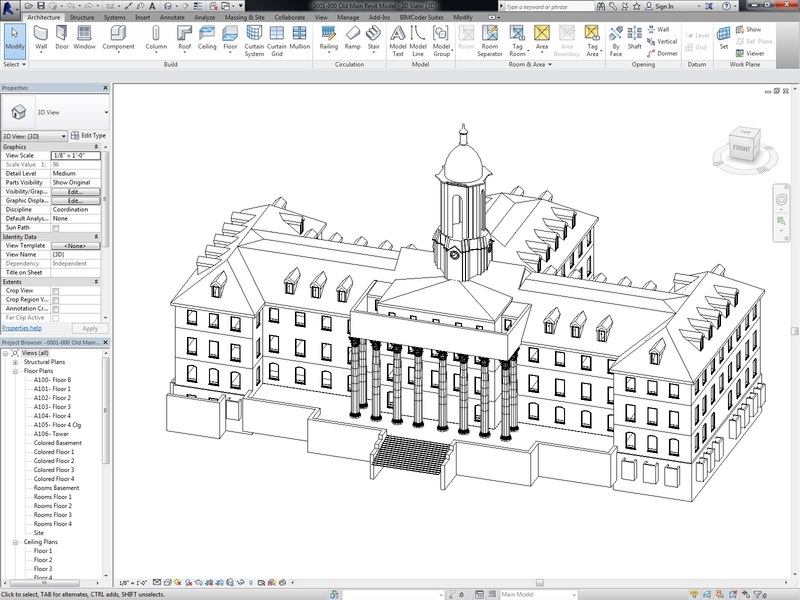 BIM has the ability to attach data and documents to model components and to deliver a 3D representation of the building and components, as well as specified data (i.e. make, model, manufacturer, etc.) for an operation and maintenance centric representation of the facility (Figure 7). If known up front, the design and construction teams have the ability to load the models with the component properties, and revise the information throughout the construction phase with any pertinent changes that may have been made due to post-coordination constraints. 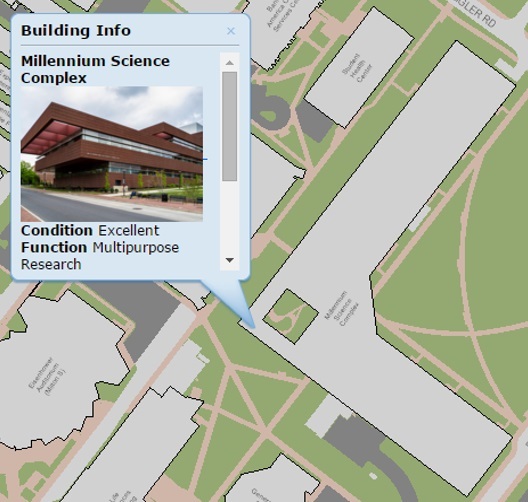 Record modeling has the ability to provide facility managers with a powerful reference of building information and limit field surveys for future renovations or retrofits. The construction phase of a facility’s life cycle is when most benefits of BIM implementation become physically quantifiable. Similar to other phases, there are many opportunities for BIM to improve the productivity of the personnel working on the project through 3D layout and the utilization of mobile technologies. However, the exploitation of opportunities like 3D coordination efforts help reduce waste and cost associated with discovering conflicts in the field. For maximum benefit of BIM in construction it is important that the construction team is involved in the early planning process in design. Altogether, BIM helps the construction team deliver a high quality product to the owner financing the project. Possibly the most common utilization of BIM during the construction phase is to alleviate system collisions. 3D coordination is often the first opportunity to be taken advantage of by construction teams, and provides the opportunity for many benefits to the field team and, subsequently, the owner. Traditionally, building systems are designed simultaneously by independent entities with potentially conflicting objectives. These designs often do not take field constraints into consideration, and need to be coordinated in order to avoid major discrepancies between designed elements. 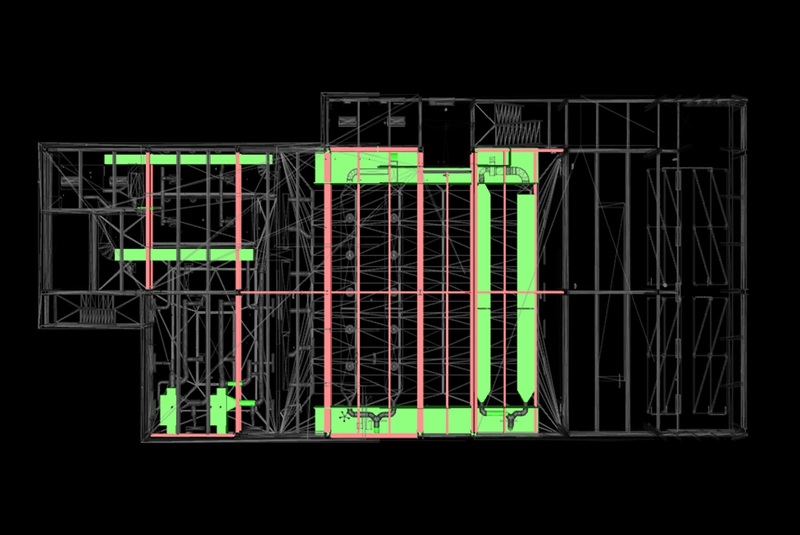 Through the federation of designers’ 3D models in a compiling software, the construction team can effectively identify where designed components collide and develop a plan to resolve the clashes digitally (Figure 8). Alleviating system collisions in a 3D model allows problems to be discussed and solved virtually, eliminating the wasted time and added cost of discovering clashes in the field. BIM is used extensively by office personnel and management teams through coordination efforts and collision resolution. However, in order to take full advantage of the benefits that BIM can provide, it is essential to put the modeling tools in the hands of the crews and workers actually building a facility. Numerous opportunities exist in order to increase efficiency and communication, and reduce waste among the construction team. Because models are often geolocated, each element within the model has a specific coordinate parameter in reference to the earth, or control points on the construction site. This is especially useful for laying out hanger locations, slab penetrations, or other components, as the information can be exported from BIM software to total stations (Figure 9). 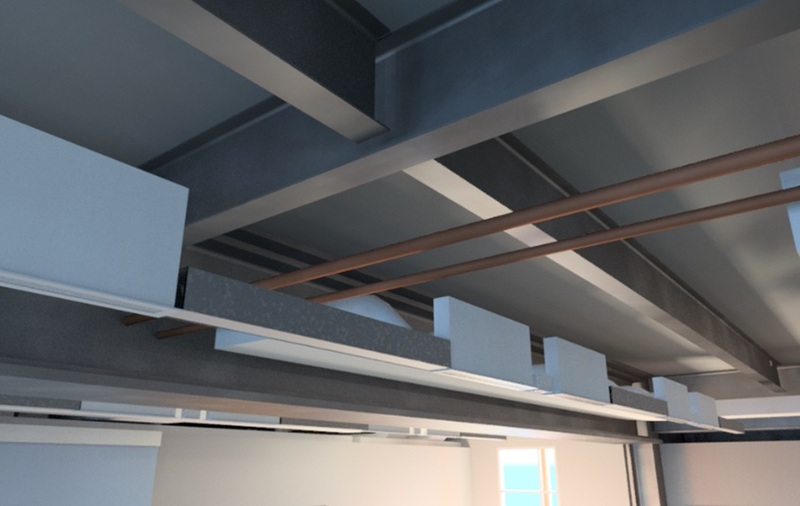 The use of BIM for laying out element locations eliminates the time consuming, potentially inaccurate work associated with traditional layout with tape and paper drawings. Utilizing technology to aid in layout makes the process much more effective, pinpointing exact element locations, rather than deriving them from provided reference grids. Additionally, the digital process increases productivity, as it is much more efficient than traditional layout. The use of BIM in the construction field enables teams to maintain a paperless site, which has multiple positive impacts. Most importantly, the implementation of mobile technology allows for the information contained in the model to reach the men and women actually putting work in place. 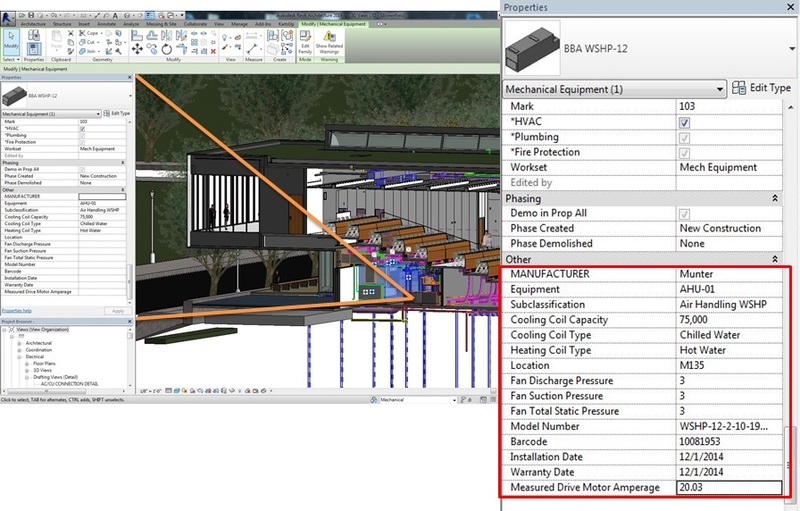 Through the use of different applications, construction workers can take advantage of the graphical and informational aspects of BIM to ensure that the work they are placing is correct, and identify any potential issues that may have been missed in coordination meetings (Figure 10). Additionally, if RFI’s and change orders result in the drawings needing to be updated, they can instantly be synchronized to the field workers’ mobile devices, eliminating the waste from working off of outdated documents and creating a single source of truth throughout the project duration. From a management perspective, key aspects of communication can be tracked, such as RFIs, response time, change order rate, etc. (Figure 10). The use of mobile devices in the field also eliminates excess drawing sets from being printed, which often results in a large amount of waste on the construction site. While reducing the cost of numerous sets being printed, the elimination of paper on site also supports the industry’s drive to reduce unnecessary waste, pursue sustainable certifications, and operate with minimal impact to the surrounding environment. Perhaps the most common use of modeling tools is the communication of the design team’s intent through the use of 3D software (Figure 11). Often, BIM itself is associated with the graphical representation of the design intent. However, design authoring involves more than graphical content, as it also entails capturing pertinent attributes of architectural features and maintainable assets to support the construction team during the submittal process. Ultimately, this information is carried through the life of the project. Reviewing the design’s development for constructability from contractors, as well as feedback from end-users and the maintenance team, is crucial to the facility’s success throughout the operational phase of its life cycle. Design reviews allow stakeholders to provide the design team with feedback from a diverse set of perspectives, and can be conducted in fully-immersive, semi-immersive (Figure 13), or traditional settings. 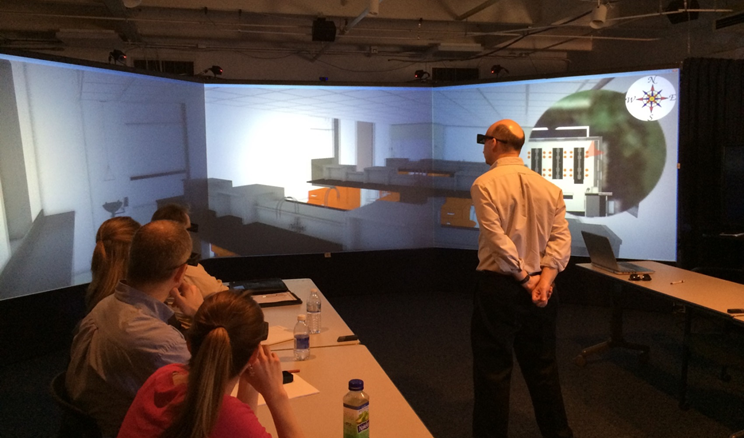 An emerging technique for design reviews involves head-mounted displays (Figure 12) to fully immerse individuals within the virtual model’s environment. While head-mounted displays (HMD) are currently limited to one viewer, developers are working to allow for multiple HMDs to be used within the same model, incorporating the value of collaborative review into the virtual experience. Regardless of the specific process implemented, the review process can uncover and avert a vast amount of costs and pain, from things as simple to adjusting a railing height to allowing ample space around mechanical equipment for the maintenance team to efficiently and comfortably keep the facility operating at an optimal level (Corvaia and Murphy 2014). Throughout the course of the design’s development, certain systems require close analysis and extra attention to ensure that they are installed correctly. The building enclosure often falls into this category, as its installation directly affects the facility’s watertight date during construction, as well as its moisture performance throughout its life expectancy. Additionally, the enclosure is a key component of the facility’s ability to maintain comfortable interior conditions and minimize costs incurred through the building’s life due to air leakage and poor thermal performance. 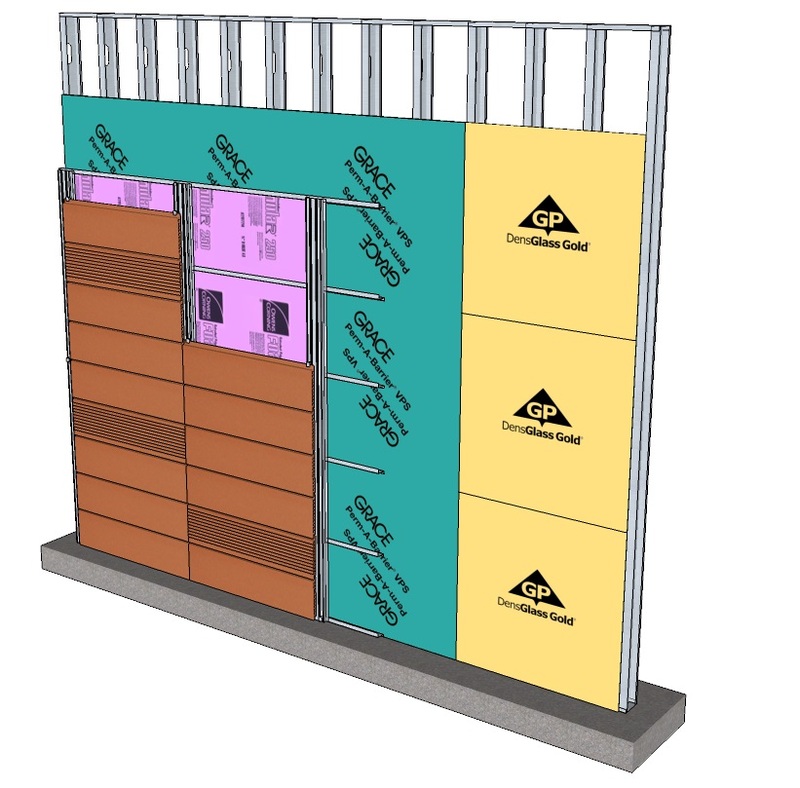 Development of virtual mockups (Figure 14) is a major use of BIM that can help ensure the enclosure’s integrity. The implementation of a virtual mockup allows the design and construction teams to pay close attention to the details of the system’s installation and discover any issues that need to be noted without the high cost of excessive materials involved in the traditional process. While the virtual prototype allows major issues to be identified and controlled in a model rather than in the field, it does not eliminate the need to construct a physical mockup in order to give the installation team the hands-on experience with the system. Large owner organizations often deal with renovations to existing facilities. In order to support the design team, detailed analysis of existing conditions should be performed during the planning phase of a project. BIM can be used to gather this data for analysis, primarily through the use of laser scanning in plenum or mechanical spaces. Laser scanners (Figure 15) utilize a laser that spins on two axes and documents the coordinates of everything the beam touches, often capturing thousands of points per second. After scanning the same space from multiple locations, the scanner can stitch together the data into a digital “point cloud,” providing a detailed, accurate, and geographically referenced representation of an existing space. Some scanners overlay digital images on the point clouds, making features in the cloud more easily recognizable to individuals viewing the cloud. The information generated from laser scans can be used in multiple initiatives. 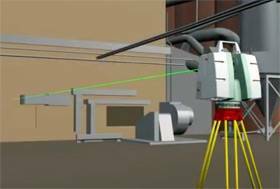 Many laser scanner manufacturers also produce software that allows the point cloud and overlaid imagery to be analyzed to perform actions such as measuring the size of elements or distance between points in the cloud, rather than going to the project site to obtain those measurements. Additionally, the point cloud can be converted to an object-based model to generate accurate existing conditions models for basis of renovation designs. Each project team needs a BIM champion. A champion is an individual who makes important decisions and tracks the overall value of BIM implementation within a project or organization. Owner involvement is critical throughout the entire process. Owners drive the process of BIM implementation by defining their needs upfront and staying involved to ensure that BIM is being implemented based on project requirements. It is essential that the project team fosters an open environment of sharing and collaboration. BIM is about sharing information, and if an environment is not conducive to collaboration, the success of its implementation is limited. 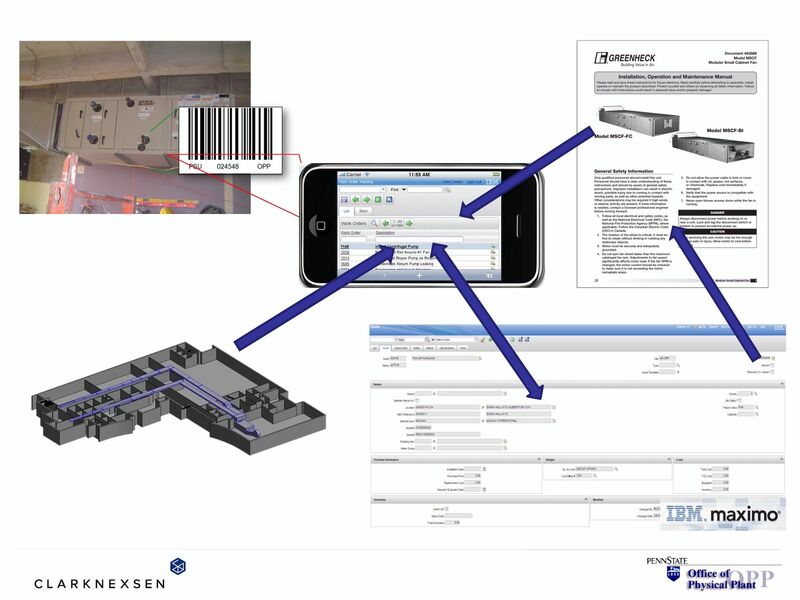 Integrated delivery methods have the potential to increase the effectiveness of BIM. 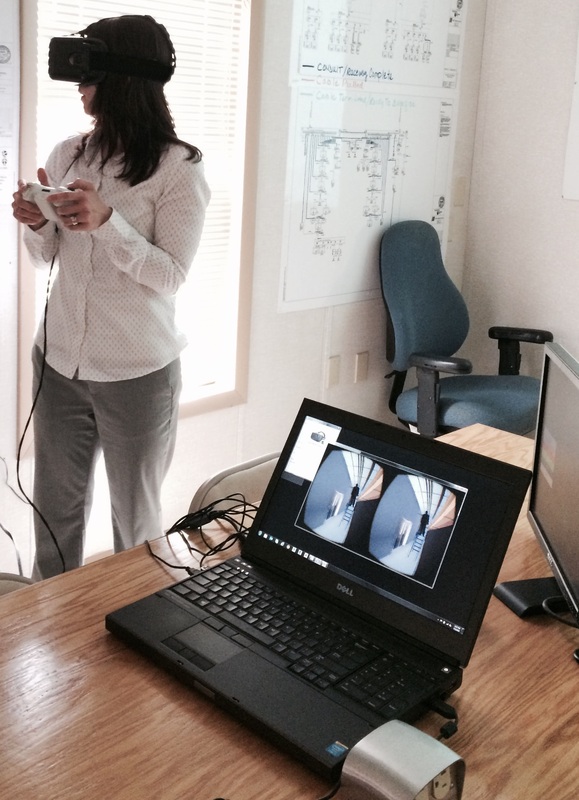 To successfully integrate BIM on a project or into facility management, the team must develop a high level of trust. In theory, integrated delivery methods (i.e. Design Build, Integrated Project Delivery) were developed to increase the teaming environment and develop trust at an earlier stage in the project, which has the potential to facilitate successful BIM deployment. There is great value in early planning. Developing an organizational BIM Execution Plan before project inception can decrease project planning time. However, it is important that the organizational goals be converted into project specific BIM goals, agreed upon the entire team. The BIM Plan should be treated as a living document. Once an initial plan is developed, it must be reviewed regularly to ensure the plan is being followed and still meeting the project and stakeholder needs. In the event of a change, the BIM plan should reflect those revisions. The appropriate resources must be made available to ensure successful BIM execution. All team members must fully commit to the implementation of BIM and have personnel available. BIM for facility owners is still in its infancy, and different case studies are constantly being developed. 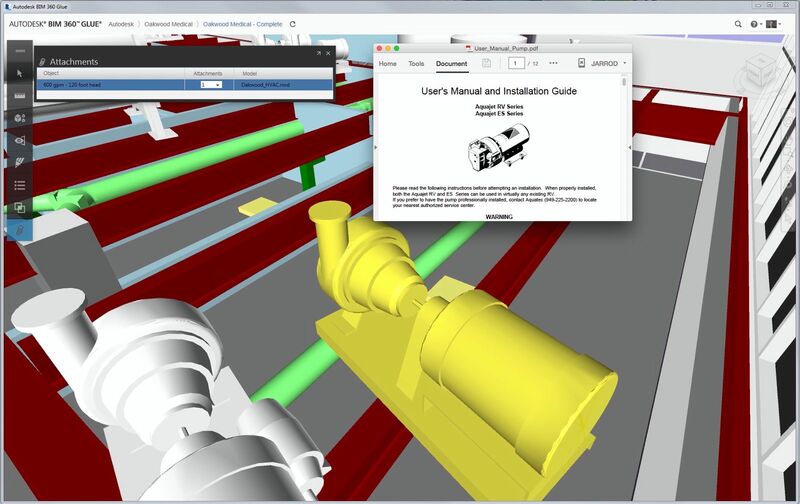 The most important lesson learned to date is that BIM does not merely involve 3D representations, but a collection of information (data, documents, models, drawings, and knowledge) shared across multiple platforms and team members. It is important that facility owners take the time to determine their informational needs based on their current methods of FM (i.e. asset management, space management, etc.). Once determined, these needs should be conveyed in a form that the design and construction teams and comprehend. Once understood, the team can develop information deliverables throughout the project life cycle. A simple rule of thumb is for the team member with the most appropriate capability to be in charge of creating the required FM information. The downstream customers of that information should be responsible for validating its value. Team members should plan on continuous information turnover rather than waiting until substantial completion, when most of the knowledge has left the project. In facility management, owners are responsible for keeping BIM up to date. Therefore, their BIM needs should be based on information that will be utilized by the FM team. Eventually, the owner can integrate 3D components or systems to add specific value to their process for advanced BIM integration. However, this may require a change in process and/or roles and responsibilities within the organization. The implantation of BIM into owner organizations is not easy, but it is an important step to reducing the large amount waste that occurs due to inadequate interoperability, and can significantly reduce the burden of future management of facilities. BIMForum (2014). Level of Development Specification, The Associated General Contractors of America, Arlington, VA.
Campbell, J.D., Jardine, A.K.S., McGlynn, J. (2010). Asset Management Excellence: Optimizing Equipment Life-Cycle Decisions, CRC Press, Boca Raton, FL. Computer Integrated Construction Research Program (2010), BIM Project Execution Planning Guide—Version 2.0, The Pennsylvania State University Department of Architectural Engineering, University Park, PA.
Computer Integrated Construction Research Program (2013), Building Information Modeling Planning Guide for Facility Owners—Version2.0, The Pennsylvania State University Department of Architectural Engineering, University Park.